Weekly Vermont Liberty Tea Company Tea Tastings! Join Vermont Liberty Tea Company each Monday as we offer samples and tastings of new blends, seasonal favorites, and a sweet treat! Learn more about the second generation of Vermont Liberty Tea Company under the new ownership of Vermont native Seth Maloney and enjoy some delicious tea! Join Bridgeside Books as we celebrate and honor Howard Frank Mosher and the release of his final book POINTS NORTH. Local author Stephen Russell Payne will join us in reading passages from POINTS NORTH and sharing personal tales of Howard Frank Mosher. 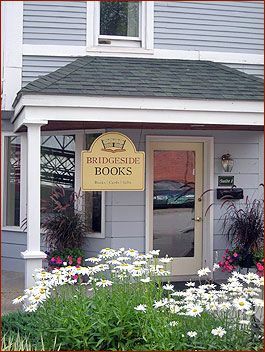 Now through Christmas Eve, Bridgeside Books is offering 20% off any children's books purchased for donation to CLiF. Books purchased elsewhere can also be dropped off at Bridgeside Books and placed under the Giving Tree! Bridgeside Books Celebrates the Season with Local Music! Join Bridgeside Books in welcoming local piano and voice students for an in-store recital. Enjoy live tunes, cider and nibbles while working on your Christmas list! For decades, Vermont author and environmentalist Bill McKibben has bummed people out with his books on climate change and the death of nature. He even bummed himself out. 105739 times over the past 30 days.